Construction and demolition waste planning is now required for all new construction. Projects can earn up to 2 points by diverting waste material away from the landfill or incinerator, and instead directing waste to recycling and salvage operations. The U.S. Green Building Council updated its credit system to Version 4 this year. New construction projects seeking a LEED certification may now earn up to 7 points in the Materials and Resources category that directly relate to architectural salvage. That’s 17.5% of a certification! Up to 4 points are available in the Building Life-cycle Impact Reduction category. Building with salvaged or reused materials for at least 25% of the building’s surface area will earn points. Planning early, before demolition begins, allows for a significant reduction in the environmental impact of the project. Salvaged materials may also contribute to Sourcing of Raw Materials credit. This credit is designed to reward designers for using responsibly sourced materials. One point is available for buildings that achieve 25% (measured by total cost) of the total value of building with qualifying products. Double value is awarded to material purchased within 100 miles of the project. Unfortunately, material counted towards the Building Life-cycle Impact Reduction credit cannot also be counted here. Building green is not only good for our environment, it is also financially beneficial. LEED certified buildings cost less to operate, lease-up faster, attract top-talent occupants, enjoy higher property values, and may qualify for additional tax credits. If you are involved in a green building project, Eco Relics is your best partner for earning material and resource credits. Eco Relics can absorb construction and demolition waste as well as supply architectural salvage for all phases of construction. Building green is our business! 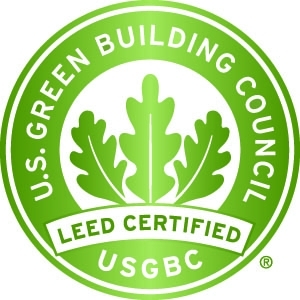 Find out more at the North Florida chapter of the U.S. Green Building Council.